Welcome to Spanish Riviera Homes! Spanish Riviera Homes was established with the aim of providing a first class service to clients buying and selling property in Spain. Customer satisfaction is our first priority and, to date, our experienced agents have sold hundreds of homes to satisfied clients. In addition to property sales, we can help you with your move to Spain, and we can point you in the right direction concerning legal, financial, and insurance services. 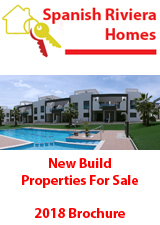 Our properties are marketed through hundreds of online portals including some of the most popular such as ThinkSpain. We also regularly advertise in the local and national press in both Spain, the UK, and other European countries. And we can often be seen at some of Europe’s largest property exhibitions. If you want to buy or sell a property on the Costa Blanca, Costa Calida, Costa de Almeria, or Costa del Sol, then please contact us TODAY and let us know how we can help you.